In March 2017, a group of 20 partners travelled to Nairobi, Kenya for a learning journey on Digital 4 Innovation. One stop of the visit was WorldLoop’s partner, the WEEE Centre. Seth Munyambu, warmly welcomed us and explained the process of collection, dismantling and sorting. The guests also had the chance to see advanced technologies for e-waste such as a cable stripper and plastic shredder or a CRT cutter works. The WEEE Centre is a clear example of a sustainable solution for e-waste in East Africa. The WEEE Centre is a unique solution in East Africa; built out of containers, the WEEE Centre has since located itself in the Embakasi neighborhood. 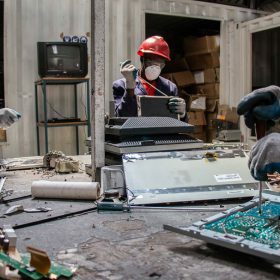 It has been conducting awareness campaigns with the aim to specifically engage corporate companies, recognising companies have quality end-of-life ICT and greater need to offset E-waste. 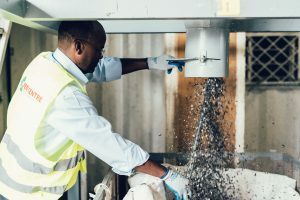 Companies in Nairobi are also becoming very conscious about the 3Rs (Reduce, Reuse, Recycle) and are every day improving their Corporate Social Responsibility activities.